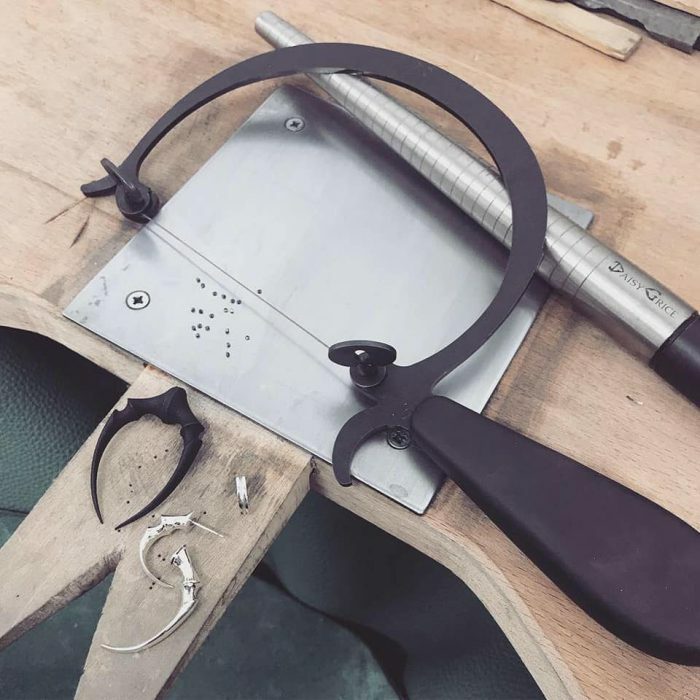 The story behind the GreenLion jeweller’s saw frame is both fascinating and unusual, and a true example of entrepreneurial spirit at its best. Its designer is a man called BJ Johnson, otherwise known as Soba One, who is the owner and featured artist of GreenLion Tattoo Studios based in Michigan, USA. Having trained as a metalsmith, GreenLion Tattoo Studio also encompasses a gallery and metal workshop where Johnson designs and builds tattoo machines as well as his wonderful saw frame. His design for the unusual frame was born out of frustration with traditional, adjustable jeweller’s saw frames where he was finding the tension difficult to achieve and having various issues with the handle. In Johnson’s own words, “all good design is rooted in simplicity”, so he set about simplifying the saw frame into a one piece, 11 gauge, sturdy steel frame with an injection moulded handle for comfort and grip. 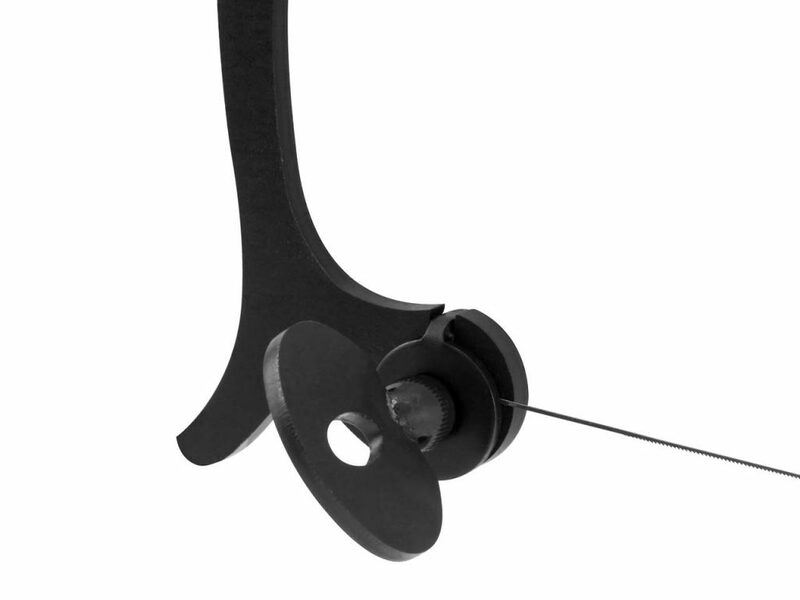 The second key feature of the GreenLion jeweller’s saw frame is the way in which the tension is achieved to hold the blade securely. Traditionally you compress the saw frame against the bench edge with your sternum, position and secure your saw blade with the screws and then release which allows the frame to spring back thus creating tension in the blade. However, the Greenlion saw frame is much stronger than a traditional frame and requires far less compression to achieve the tension required for a blade. Johnson has added unique “not just for looks hooks” at either end, which allow you to compress the frame using just your finger and thumb – meaning you no longer have to push it against the bench, which requires far less effort. The third and final feature is the reversible thumbscrews, making this frame ideal for both left and right-handed jewellers – but this is also quite handy if they are getting in the way when sawing using a jig or vice; simply reverse the thumbscrews and away you go! The Greenlion saw frame is only produced in small batches and is exclusively available through Cooksongold in the UK, so this is not something you are going to see everywhere. On the face of it, you might initially look at the price of the frame and reject it on that fact alone. However, once you discover how and why it was developed you can appreciate just why this saw frame costs a little more than a standard jeweller’s saw frame. This is not produced by a large manufacturer as part of a huge range; it is a carefully devised product, designed by a tattoo artist and metalsmith in America who wanted to solve a problem. Want to add this saw frame to your own workbench? Order yours today from Cooksongold and see for yourself why it is such a popular tool among jewellery makers.